Back in the summer of 2014 Mercedes revealed the initial blueprints and designs for it's brand-new Vito Van, adding a fresh outlook to one of the fastest growing ranges of any vehicle type. Now it's finally arrived we can see the fantastic quality of what has shaped up to be a stand-out vehicle. The latest itteration continues the Vito's traditionally sportier looks that have served it so well over the last ten years, and the 2015 Vito is poised to shake-up the van market and challenge industry leaders such as the Vauxhall Vivaro, Ford Transit and VW Trasnporter. All these vehicles have established themselves on the scene, and remain some of the most recognised vehicles of their kind. Mercedes will hope to join these esteemed candidates or at the very least rattle their cages. 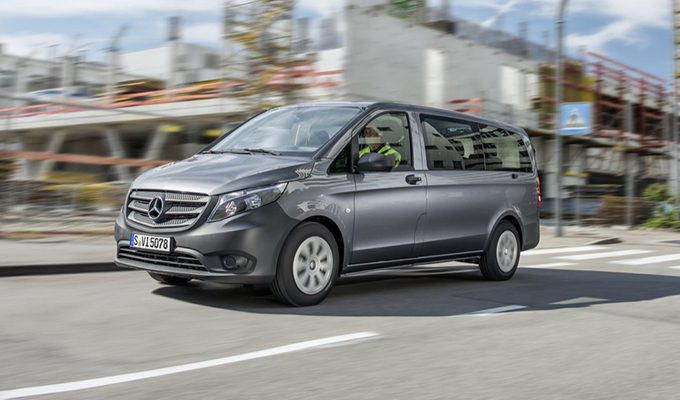 The Vito will be available in a variety of different forms, including the tourer, crew and panel and all of these models will have a wider, more flexible set of dimensions than the precluding model. The Vito will also blend striking exterior touches with greater mpg and the largest cargo, and storage room (1,369kg) of any vehicle in the class. This will be possible due to longer dimensions and a staggering max height of 1,910mm. When it comes to the engine, you'll be spoilt for choice as the new Vito boasts five diesel engines and will also for the first time ever offer front, and rear wheel drive. Increased wind resistance will also make the vehicle far more ecoomical, and if you're feeling especially green we'd encourage you to take a look at the BlueEfficiency package which in partnership with the 116CDI will return 49.6mpg. One of the most important factors when considering the lease or purchase of a modern commercial vehicles is the sheer amount of safety features on offer. In the Vito's case standard kit will offer brake discs, Adaptive ESP and upto eight airbags in the tourer version as well as Crosswind Assist and tyre pressure monitoring. Attention Assist is largely considered a necessity, and is available free of charge. There are also a wider range of safety systems available and you can tailor all of these to your personal requirements. You can find all of these on the Mercedes website. Manual will be standard, but owners of the 114CDi and 116CDi versions will have a choice to secure a 7G-Tronic auto gearbox free of charge. LED Indicators, Intelligent Light System, Daytime running lights, low beam headlights and main beams are all features that are to be expected these days and it would be foolish to ignore the wealth of features that this vehicle will now offer. Over 300,000 vans or commercials were registered in 2014, with more than 26,000 in December alone. Mercedes was the 6th best selling manufacturer of commercial vehicles by March 2014. This was only expected to grow in popularity especially as the Vito and it's cousins became more widespread as the months advanced. It is likely a large proportion of these regsitrations were via the medium of leasing, which is becoming a more effective and accepted method of securing a quality commercial vehicle. The crux of what the Vito will offer is very heartening for any potential customers and it's handsome, streamlined design offers an alluring proposition. Visit our designated page to recieve a Mercedes Van Leasing quote or alternatively, for an instant, no-obligation quote on any commercial vehicle, email: info@selectcontracts or call: 0845 6770 770.